I already posted some stuff about the MythBusters Jr. slinky defying gravity thing—here are those notes. But how do you make a model of a falling slinky? Remember, you don’t fully understand something until you model it. Also, with a model you can quickly test different situations. What happens if you put a car on one end of the slinky (or massive spring). What kind of spring constant do you need? What if the two masses are different? All of these questions can be investigated with a model. Let’s get to it. Of course, I am building my model with python—because I like python (and so should you). Here is my code. This is what most of it looks like (sorry, I can’t embed here). Here is a gif of the output. The balls wait a short time before dropping—just to make it dramatic. I have calculated the position of the bottom mass so that it starts in equilibrium. If you don’t do that, the bottom mass will just oscillate up and down and ruin the whole thing. I added two objects—a stick on the side and a free falling ball. That way you can see how the spring thingy falls. Oh, you should absolutely try changing things up and running the model. Here is how the model works. There are two masses (the ball1 and ball2)—just ignore the other objects, they don’t matter. Once the top mass is let go, there are two forces on the two balls. 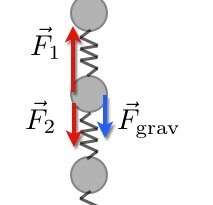 The downward gravitational force and then the spring force. Whatever the spring force on the bottom ball is, the top ball has the opposite. The gravitational force is easy to calculate. For the spring force, you need to know the natural length of the spring and the distance between the masses. The spring force depends on the difference between the distance and the natural length—then just multiply by the spring constant. Yes, I often mess up the sign on this force so that the two objects get pushed away in a weird motion. After that, you are pretty much done. Use this force to update the momentum and then use the momentum to update the position. Here are some things for you to try. What if the top mass is 0.1 times the bottom mass? Does this still work? What if the bottom mass is 0.1 times the top mass? 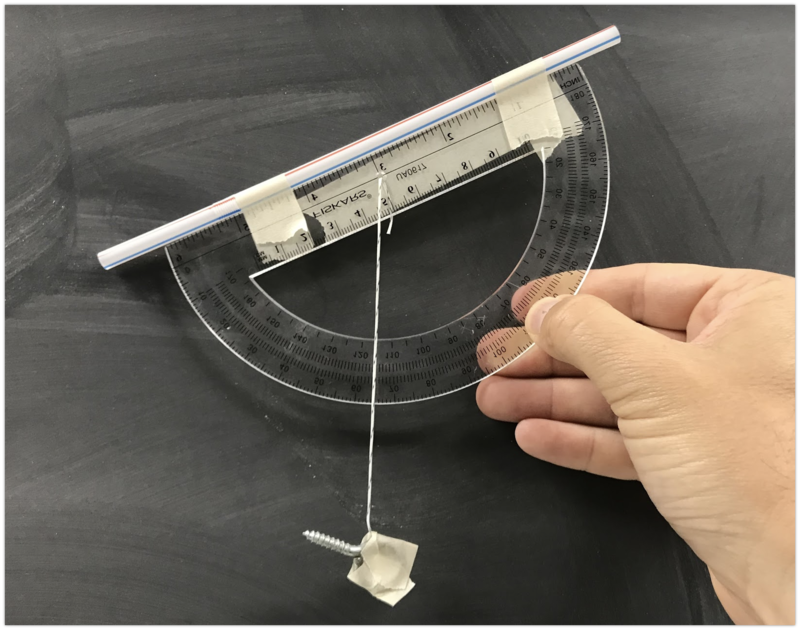 See if you can calculate and plot the vertical motion of the center of mass of the two ball system. What if the spring also has mass? There is a way to model this, but I’m going to make you think about it first. Suppose I want to do this with a 2000 kg car. What spring constant would I need? What natural length of a spring should I use? It happens all the time. It even happens to you. There is a new lab you want to try out—or maybe you are just modifying a previous physics lab. You are trying to make things better. But when the class meets—things fall apart (sometimes literally). Yes. This is what happened to me this week. And yes—it’s OK. But let’s look at the lab and go over the problems so that I can make it even better for the future. This is a lab for the algebra-based physics course. It’s always tough because many of the first things they cover in the lecture class don’t have lab activities with things you can measure. Oh sure—there is that electrically charged clear tape lab, but it will be a while before they get to circuits. So, my idea was to have the students use python to calculate the electric field due to a point charge. This would give them a safe and friendly introduction to python so that we could use it later to get the electric field due to other things (line a dipole or a line charge). It would be great. Review vectors. Add two vectors on paper (not with python). Find the displacement vector – given the vector for a point, find the vector from that point to another point (the vector r). Find the unit vector and the magnitude of a vector (using python). Next, find the electric field due to a point charge for the simple case with a charge at the origin and the observation point on the x-axis. Do this on paper. Now do the same calculation with python. Find the electric field at some location due to a charge not at the origin (in python). Use python (or whatever) to make a graph of the electric field as a function of distance for a point charge. Graph paper is fine. If they wanted to, they could do the calculations by hand (or use python). Finally, give a quick overview of the sphere() and arrow() object in glowscript. Here are the problems students had during this lab. Computer problems. Yes—whenever using computers, someone is going to have a problem. In this case, it was partly my fault. There was one computer that was broken and some other ones weren’t updated. Honestly, the best option is for students to bring their own. I can see that there are some students that just sort of “shut down” when they see computer code. They automatically assume it’s too complicated to grok. Students working in big groups. I hate having 4 students use one computer. That’s just lame. Too much lecture. The first time I did this, I spent too much time going over vectors with not enough breaks for students to practice. I partially fixed this for the second section of lab. Some students were just lost on vectors. Yes, the unit vector is a tough concept. I’ve learned this before—but I guess I need to relearn. The visualization (sphere and arrow) are just too much for many students. That’s why I moved it to the end in my second section. So, that’s it. I am going to rewrite the lab stuff on trinket.io. I am also going to change my material for the dipole stuff that they are doing next week. Hopefully it goes well. Let’s just see. Tonight’s episode (actually there are two episodes tonight) looks at the famous slinky drop problem. Let’s start with the first place I saw this—from Derek Muller (Veritasium) even though he didn’t invent this either. That’s pretty awesome, right? Of course the first thing I want to do is to make a model of a falling slinky. Here is that first post. It’s important that the slinky itself has mass. You can’t use the normal assumption of a massless spring. The best way to model a spring with mass is to have a bunch of smaller masses connected by massless springs. When the slinky is dropped, the center of mass falls with a downward acceleration of -9.8 m/s^2. However, since the slinky is contracting this makes the bottom of the slinky motionless. Here is an animation of my python model. Sorry—this code is older and I don’t have it on some online platform (I will try to update that soon). But here is the important plot. What if you look at the vertical position of the top, bottom and center of mass for this “slinky”? Here’s what that looks like. 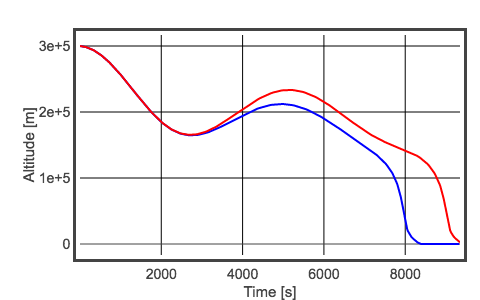 The red curve is the bottom mass. Notice how it “hangs” there? Awesome. But can you just put a mass (like a car) on the end of a spring and drop it? Yes, but it won’t look very cool. The key is the center of mass. You want the center of mass to fall such that the bottom mass stays in place. With a car and a spring, there is no top mass moving down faster than the acceleration due to gravity to make the bottom mass (the car) move up relative to the center of mass. In the end, you need some type of mass at the top of the spring too. So, that could work. Two large masses separated by a spring. When you hang and then drop, the bottom mass will be stationary. But wait! You can try this yourself. Get two masses and connect them with rubber bands (even though rubber bands aren’t ideal springs). Hold one mass and let the other hang below. Now drop. Here’s what that looks like in slow motion. Sorry about the vertical video, when I recorded this I didn’t think I would post it. But wait! What if you want to make something like the slinky? In that case you can get a bunch of masses and connect them with rubber bands. It will be just like the python animation above, but in real life. I should have recorded this in slow motion. Oh well. Just for fun, here are some of my original notes in which I estimate what kind of spring you would need to do this drop thing with two cars. In order to keep my blogging certification up to date, I am required to post some type of year end review. OK, here it is. These are my “best” or “favorite” posts from 2018. Maybe these didn’t get the most traffic, but they are ones that I like the best. It’s all about me. You might think this list is long, but I just counted. I had 106 blog posts for the year of 2018. So, these all “made the cut”. Also, I normally just list the posts but this time I will give a brief description. There is indeed gravity in space. Common ideas about gravity. Really, this post is all about a TV show – The 100. In one episode, a boy is floating around in a space ship during the re-entry process. This leads to a discussion about how gravity works and what happens during re-entry. Flying planes with tiny collisions. This really isn’t a blog post—at least not like a normal post. This is really just a holder for my WIRED video on how airplanes fly. This short explanation covers flying using the momentum principle instead of Bernoulli’s Principle. 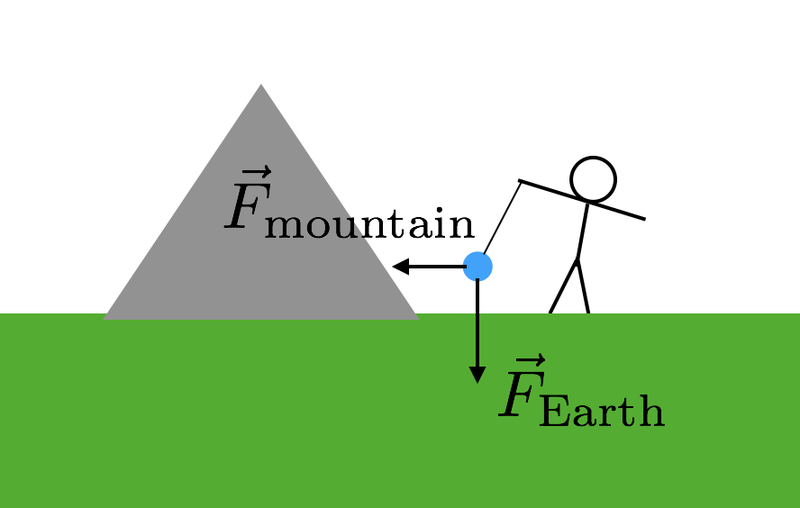 Finding the gravitational constant with a mountain. The gravitational constant is needed to find the gravitational force between two objects with mass. The problem with finding this value is that it’s very small and we (humans) didn’t initially know the mass of the Earth. Here is a method to find the gravitational constant by estimating the mass of a mountain and detecting the change in gravitational field with a pendulum. It’s just so crazy it might work. Oh, the real tricking part is find the direction of “up” and “down”. 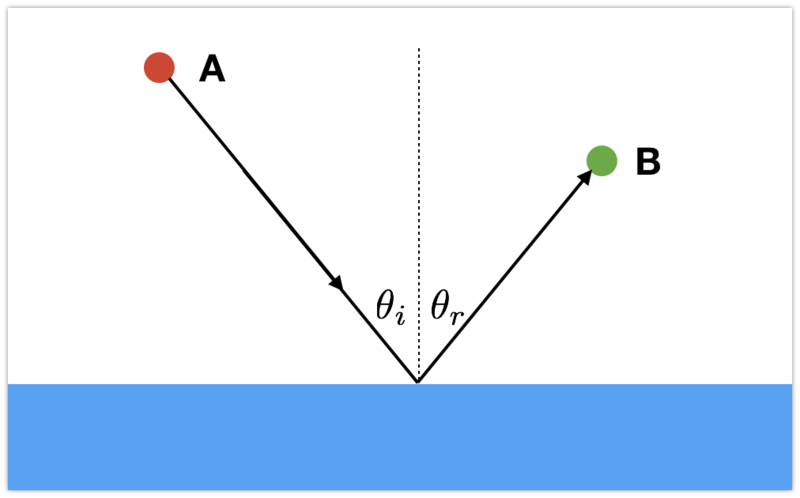 Calculating the angle of reflection with a numerical calculation. Everyone knows (or should know) how much I love numerical calculations with python. Here is a demo to show the angle of reflection is equal to the angle of incidence using Fermat’s Principle. This says that light takes the path of shortest distance. Why is it so difficult to predict where a satellite will crash from orbit? 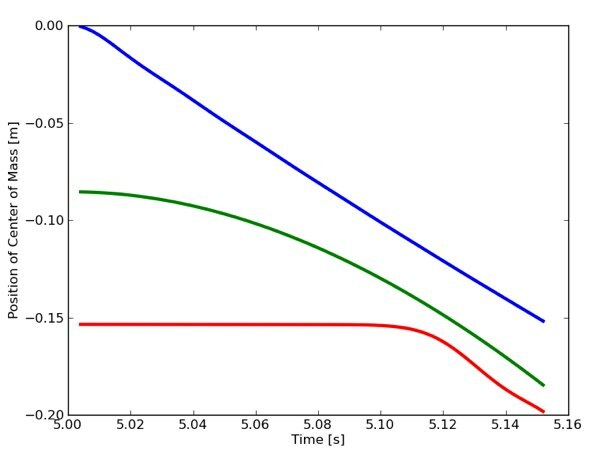 Here is another numerical model (python) to show that with slightly different initial conditions, the Taingong-1 spacecraft will crash at a different location. Code included. Random walks in 1D, 2D, 3D, 4D—and why we live in 3D. First, there is a random walk. Second there is a random self-avoiding walk (SAW). A self avoiding walk doesn’t cross its own path. So, a SAW is like a long protein—which is important for life. 3D works the best for proteins (and not 4D). 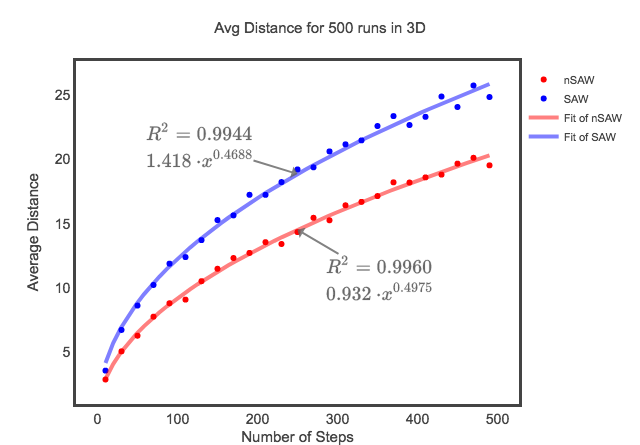 In 4D, there is no big difference in length vs. step number for SAW and normal walks. In 3D, it’s more likely a walk will cross itself—which is important for protein folding. Yes, there is lots of python code here. Note: random walks in 4D are tricky since you can’t just use the position of the walk as a built in 3D vector class. Video analysis of a race with The Freeze. The Freeze is this guy that races mere mortals on a baseball field. He’s fast. Very fast. He gives the victim a head start and still wins. So, here is my analysis along with some physics homework. Celestial navigation with a protractor and a watch. This is one of my blog posts that goes along with an episode of MacGyver (since I’m the technical consultant for the show). The idea was that MacGyver would use some stuff from a car to find out how to get to a base from his location in the desert. The cool part is that navigation is really just using a compass to measure angles and clock to measure time. Note: for this particular episode, I did a bunch of calculations to get the exact angle and time measurements they would use in the show. I don’t think they made it in the episode, but I did it. Also, I had to cheat since everything happened at night and MacGyver couldn’t find the time of local noon. Modeling the trajectory of turbo lasers in The Last Jedi. Yes, a Star Wars post. SPOILER ALERT – there is a space battle in Star Wars The Last Jedi. They show this First Order ship firing on the Resistance. In order to make it look like a WWII sea battle, the turbo lasers have an arc to them—that looks cool, but it wouldn’t happen. So, what do I do? Other than enjoy the movie (which I do), I first do a video analysis to determine the vertical acceleration. Then I make a python model to recreate the arc. Fun. Oh, here is the code. Also, I think I did this same type of thing with TIE bombers from Empire Strikes Back. Maybe that should have been in this list too. Some thoughts about science communication. Some science communication mistakes are worse than others. I’ll just leave it at that. Physics model of a running human. How do you model the motion of a running human? How do you take into account the idea that they can’t keep speed up forever? Here is my basic model. Humans are like a ball that impacts with the ground. When a human hits, they can only exert some maximum force to change the momentum. The vertical component of this force pushes them back up to keep them in the air for some amount of time. There is a minimum time the human must be in the air to switch back and front legs. The faster the human runs, the lower the ground contact time. Eventually a human reaches a speed such that the contact force is only up and not increasing the speed anymore. I really like this model. It makes me happy. Code included. Does the Sun orbit the Earth or does the Earth orbit the Sun? OK, we all know the Earth orbits the Sun. But how can you tell? Here’s the answer. 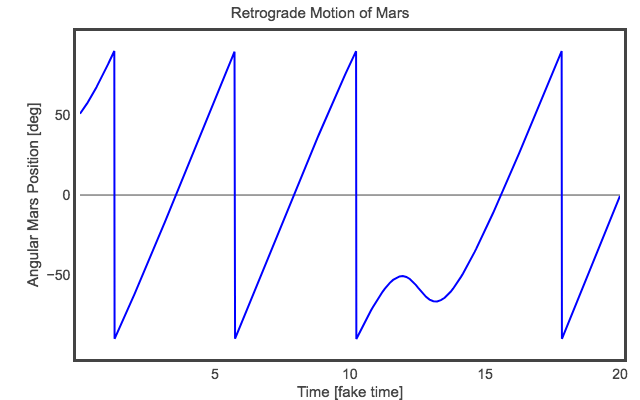 Oh, and I also include a python model of retrograde motion. What is boiling? Great demo. You should try this yourself. What’s the difference between mass and weight? This is a surprising confusion for students. Here is an explanation of mass vs. weight. 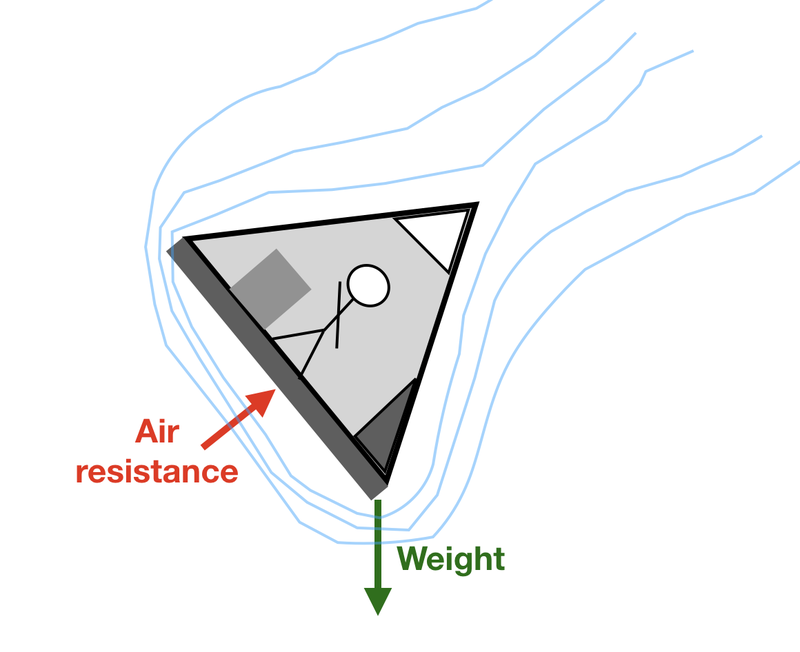 Also, here is a great experiment to calibrate an inertial balance (that doesn’t need gravity). In Star Wars A New Hope, there is a scene that shows the escape pod leaving the blockade runner (near the beginning of the movie). It turns out that this shot was created by dropping a model and viewing it from above. Here is my video analysis (with angular size) to show that the model is indeed accelerating as it moves away. Bonus: one of the guys that made this special effect sent me an email after I posted this. Winning. Build a radio transmitter – mostly from scratch. I started off writing a book review (How to Invent Everything: A Survival Guide for the Stranded Time Traveler – Ryan North). In the book, he suggests that if you were starting from scratch it would be easier to build a radio transmitter than it would be to build a clock. Of course (from a previous post), a clock is important for navigation. If you had a radio transmitter, you could just broadcast the time. OK, but how difficult is it to build a transmitter? Not too hard. I did it. Here is my spark gap transmitter. Why are you still here? Oh, you are waiting for just one more post? Or maybe you think this was too many? No, it’s 16 out of 106. That’s just 15 percent of my posts. Who is Rhett? Where is he from? What are his super powers? Why do you want to contact Rhett for your project? Let’s answer these questions. How about just the highlights? Yes. Born in the past, not the future. B.S. in physics from Benedictine University (although it was called I.B.C. back then). M.S. in physics from the University of Alabama (including work at CERN). Ph.D. in physics from NC State University. Associate Professor of Physics at Southeastern Louisiana University. Yes, I like to write. Blogging is the best (for me). It’s quick and free form. You can use a variety of tools (video, gif, graph, python). It’s just the best. THE BEST! I should probably include some of my favorite posts—but there are just too many that I love. If you want a post on a particular topic (like video analysis)—just google “rhett allain video analysis” and that should get you what you need. Here is my WIRED blog stuff. Oh, I also blog here—but I guess you already know that. I am currently the technical consultant for the CBS show MacGyver. It’s a super fun and awesome job. But what do I do? Essentially, I help out with the “MacHacks” in the show. I look over the hacks and see if they are at least plausibly based on some real thing. Other times, I make suggestions for hacks. Finally, I offer suggestions for some of the science-type stuff that MacGyver says. Oh, I also make DIY home-versions of hacks. Here is an example. As a bonus, here is an interview I did with CBS KPIX out of San Fransisco on my work with MacGyver. I’ve actually been working on MythBusters much longer than I have worked for MacGyver. I worked on about the last 4 seasons of the original MythBusters and then I did the reboot with Jon Lung and Brian Louden. Finally, I worked on MythBusters Jr. So, what do I do? Really, there are two things. First thing is to do some background check on future myths. For some myths, I do some estimations and calculations to see if there is a chance of a myth working. You don’t want something that is either too easy or too hard, it should be just right. The second thing I do is the science explanations. When there is a short explanation about how something works, I help with that. Writing books isn’t as much fun as blogging, but there it is. Here are the books I have authored. I could talk about books more—but I’m just going to leave it at that. It’s not my fault. If you want to blame someone—how about Bruce Sherwood and Ruth Chabay. It is through their textbook, Matter and Interactions (Wiley), that I was introduced to python and numerical calculations. It’s awesome. Once you start solving problems by coding, it sort of gets addictive. I’ve been creating python programs since about 2003 (just a guess). Later I started putting more and more of it in my classes—and here we are. I’m not an expert coder, but I am an expert at implementing this stuff in introductory courses. That’s what I do. I have even held workshops for teachers and educators. It’s fun. If you want to look at the stuff I’ve done, here are three versions (all online). Physics Python for Mere Mortals. This is an online type book with embedded code. Designed for intro students with zero previous programming experience and some physics. This is what I use in my lecture and lab courses. Introductory Physics with Python. This is more like a full book. It’s incomplete, but the idea is to teach physics using python. I want to work on this some more. Numerical Calculations in Physics. I wrote these as tutorials for students in the calculus based physics course. It uses more vectors and stuff than the over stuff. Again, I could list a BUNCH more stuff on python but I won’t. The physics of Star Wars and science fiction. Video Analysis (real vs. fake videos). The best physics models (python and stuff) and estimations. Science communication (blogging, MythBusters, MacGyver). The physics of video games. Learning about physics learning (education stuff). I’m not a huge video guy, but I do make videos. Here is one that turned out better than I expected. It’s a video made at WIRED. Here is another one that I made (from my youtube channel). Here is one more. I like to make videos that show physics solutions. Wait. One more. This one is a more advanced video. Contact me if you want to work on something. I’m always looking for extra jobs. I like to solve physics problems. Here is one for you (I just made it up). A 4 meter ladder leans against a frictionless wall at a 30 degree angle. The mass of the ladder is 10 kg. A human stands 1 meter up the ladder and has a mass of 70 kg. What is the minimum coefficient of static friction between the floor and the ladder so that the ladder doesn’t slip? Here is the solution—in video form. But wait! There’s more. Let’s do another problem. Suppose you have the same ladder and the same human. However, in this case the coefficient of static friction between the ladder and the ground is 0.55. How far up can the human move before the ladder slips? I like this question because I don’t know how the answer will turn out. That makes it fun. So, let’s do it. But what kind of problem is this? I’ll make this a multiple choice question. Here are your options. Your answer? Go ahead and answer. It’s important to think about things like this if you want to become an expert problem solver. Did you pick? OK, I’ll tell you that there will be quite a few students that will say this is a friction problem because it has a coefficient of friction. That’s not untrue—but it’s not a good way to classify the problem. You could also say this is a “ladder problem”—again, not untrue but not helpful. This is an equilibrium problem. We are trying to find the point at which the ladder slips—the point it leaves equilibrium, but it’s still sort of in equilibrium. For an object in equilibrium, there are two main ideas—especially for a rigid object. First, it must have zero net force. Second, it must have zero net torque about any point. In two dimensions, I can write these two conditions as the following three equations. In this expression, F is the applied force, r is the distance from the point at which you are calculating torque, and is the angle between r and F. This equation is equivalent to F-perpendicular times r or F times r-perpendicular. Oh, torques that would make an object rotate clockwise are negative. One last thing about torques—especially the sum of the torques. If an object is in rotational equilibrium about some point (point “o”) then it is also in rotational equilibrium about any other point. When you set up the torque equation, you can pick whatever point you like to sum the torques—it’s your choice (but choose wisely). Now we can start setting up some equations for equilibrium. I’ll start with a force diagram for the ladder. I know that’s a little busy—but it will have to do. Here are some comments. There are two normal forces. One from the wall (labeled 1) and one from the floor. There are two gravitational forces—and this is a cheat. There is a gravitational force on the ladder and it is as though it is one force acting at the center of mass for the ladder. If the ladder has a uniform density, the center of mass is the center of the ladder. The other gravitational force is fake. This force is there to represent the weight of the human. But that gravitational force acts on the human, not the ladder. The ladder pushes UP on the human the same as the weight. Since forces come in pairs, an upward pushing force from the ladder means there is a downward pushing force from the human on the ladder. It’s equal to mg, but not mg. 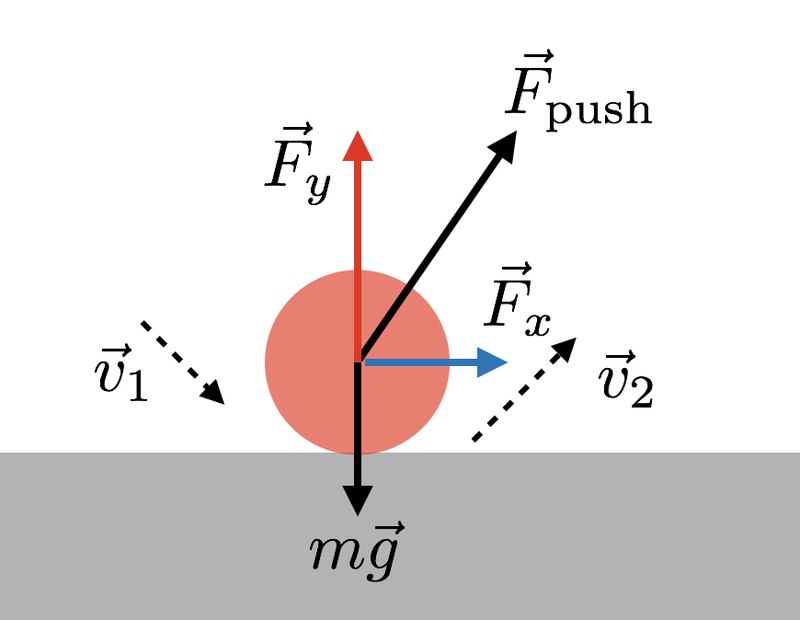 The friction force is parallel to the floor. The maximum magnitude of this friction force would be: where is the coefficient of static friction. Now for some equations. First, this is the sum of the forces in the y-direction. Just a quick reminder. These are not vectors. These are components of vectors in the y-direction. That’s why the two gravitational forces have a negative sign. I guess I can simplify this a little bit. Next is the sum of forces in the x-direction. Since we are at the point of maximum friction, I can include the expression for the frictional force in terms of the coefficient. Notice that I know the value of since it only depends on the mass of stuff—but I don’t know . I’m going to need another equation. That’s where the sum of the torques comes in. In order to write down the sum of the torques, I need to pick a point about which I calculate the torque. I’m going to go with the bottom of the ladder. At this point, there are two forces applied. Since they are applied at the point about which the torque is calculated, they contribute zero torque and they won’t appear in the equation. Winning. Here is the sum of the torques about point O (at the bottom of the ladder). What do I want to solve for here? I want the distance the human goes up the ladder. This is the value “s” in the expression above. Really, I have all the values I need in that expression to solve for s. I just need to set to the maximum frictional force. But that would be boring. Instead, let me make a plot of the frictional force as a function of human distance up the ladder. That will be more fun, right? 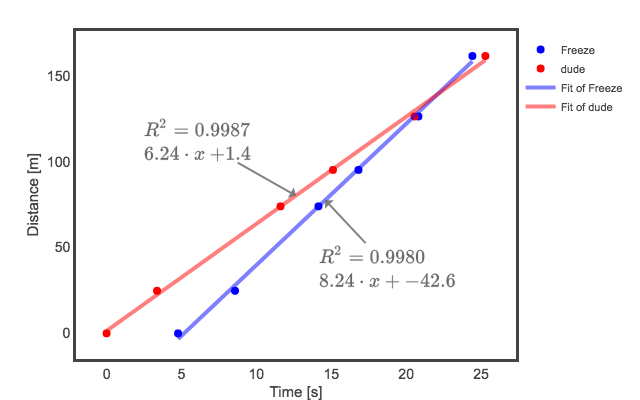 From this plot, the human can go up 1.16 meters before the required frictional force exceeds the maximum. Oh, here is the code for that plot. Now that you have the code, you can change stuff—like the angle of the ladder or the mass of the human or whatever.